Being out of position in any hand of poker is not going to be make your decisions easy. However, this does not mean that we can’t use a few tricks to make it work to our advantage when we hit our strong hands. This article will discuss how you can work around the fact that you are out of position to your opponent and use it to your advantage to maximize your wins with a strong hand on the flop. 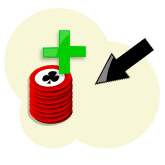 Here's my quick guide to betting into the preflop raiser. Betting into preflop raiser example. Lets say we are heads up in a Holdem game and out of position to an opponent after we called their preflop raise. Ideally, this isn't a situation that you would want to find yourself in, because it means that you would have called a raise preflop knowing that you would be out of position for the rest of the hand. So to be in this position in the first place, we probably have a relatively strong hand with big cards, or a hand with a lot of potential like a small pocket pair. When we get to the flop, it is standard play for most players to check to the raiser regardless of whether we made a strong hand or not. Similarly, it is the standard play for our opponent to make a continuation bet to take down the pot, regardless if they have a strong hand or not. This is because players in our sort of position will want to see how our opponent will react after our check, and the majority of the time our opponent will make a standard continuation bet in an attempt to capitalise on the weakness we have shown from our check. If you play at a high enough level for long enough, you will see this take place time after time. We are obviously going to be folding our hand if we have not connected with the flop after the continuation bet from our opponent. However, if we have made a strong hand, then many players will be tempted check their hand to their opponent in anticipation that they will bet out, and then we can come over the top with a check-raise and trap them. This all sounds well and good, but when you think about it logically, you are missing out on a prime opportunity to extract a nice amount of money from your opponent. If we make a check-raise play with our strong hand in this situation, one of two things are likely to happen. Because the check-raise is such a powerful play, we are basically telling our opponents that we have the best hand. Therefore they are going to fold any weak or decent hand, and possibly call with their second best strong hand but be wary of continuing with the hand. The check raise gives away too much information about the strength of your hand, whereas a bet from first position doesn't give much away. Sure we could be bluffing, but it would be a dangerous play, and so our opponent would not want to take the risk to find out if we are by calling or re-raising with a mediocre or even a strong hand. So the majority of the time we are going to be cutting off our action at the flop when we have a strong hand, and not giving ourselves the opportunity to extract more money on future betting rounds. Playing strong hands against the preflop raiser. In my opinion, a great way to play a strong hand in this situation on the flop is to simply bet out. By betting out straight away on the flop, we are making it look as though we have a mediocre hand and that we are trying to stand our ground and take the pot. You will often find that any intermediate player that comes out with a bet on the flop is making a feeble attempt to win the pot with their half decent hand, and so a simple raise on our part when in position is often going to be enough to get them out of the pot. So if we are betting out with our strong hand, we are making it look as though we are that feeble player hoping to sneak the pot away. Now most intermediate to advanced players are aware of the fact that players make this kind of bet to try and win the pot, and so it is pretty likely that they are going to raise with any high pair, over-pair, draw or even on a bluff. So at the end of the day, the likelihood that we are going to get raised is pretty high. Therefore we will have already increased the amount we can expect to win from the hand, because we now have our opponent putting 3 or 4 times the amount into the pot than they would have done if we attempted a check raise. On top of this, our hand is still disguised from our opponent and so we have the potential to win more money on future betting rounds. Example (and advantages) of betting out first. If we make a call to see a flop with a hand like 6 6 and the flop comes 2 6 J , we are in a great position to make a killing. By betting out, our opponent is likely to assume we have a mediocre hand like a pair of jacks or sixes, and so they will re-raise us with any overpair or hand like KJ or AJ because they will feel that they still have the best hand. If we check-raise however, our opponent will be wary of the strength of our hand and reconsider the strength of their jack, and slow down with any overpair. So betting out will set us up for that bigger win each time. There are far more advantages to betting out first as opposed to check raising, so there is no need to try and play tricky poker. From here on out we have to make the decision on whether or not to call or re-raise this raise from our opponent. In general, we should look to call if the board looks safe and look to raise if the board appears to be dangerous with potential draws. It is likely that we can win more money on the turn and river if we call, because as far as our opponent knows we could well be holding onto our mediocre hand hoping for the best. But then we don’t want to give them the opportunity to draw out on us by calling. So you have to weigh up whether it is going to be more profitable in the long run to call and try and win more, or raise and take down the pot. But who knows; if you raise, you may still get a call and win a pretty sizeable pot. Betting into the preflop raiser evaluation. This kind of play assumes that we are out of position and heads up to an opponent that knows a bit about the game of poker. This is because we will be relying on the fact that they will see our bet out as a sign of weakness, and raise us in an attempt to stop the action and win the pot. Sure, sometimes our opponent will fold when we bet out, but a lot of the time we will be raised and be in a prime position to win a much bigger pot than if we had attempted a check raise. So we will be winning more money in the long run by betting out and winning a huge pot every now and then, rather than trying to be sneaky and frequently win small pots. So try betting out when you hit a monster flop. You will be surprised at how much more you will be winning overall.